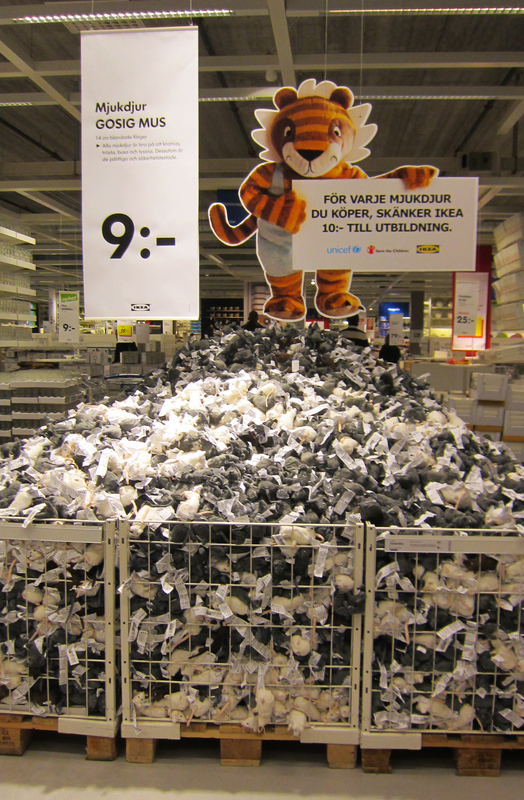 IKEA has a mouse problem. I was shocked when I ran into this today. I believe these mice made their debut two years ago. At that time I bought some as favors for my daughter’s birthday party. So to still see this many lying around made me wonder…..
Are the mice really that popular? 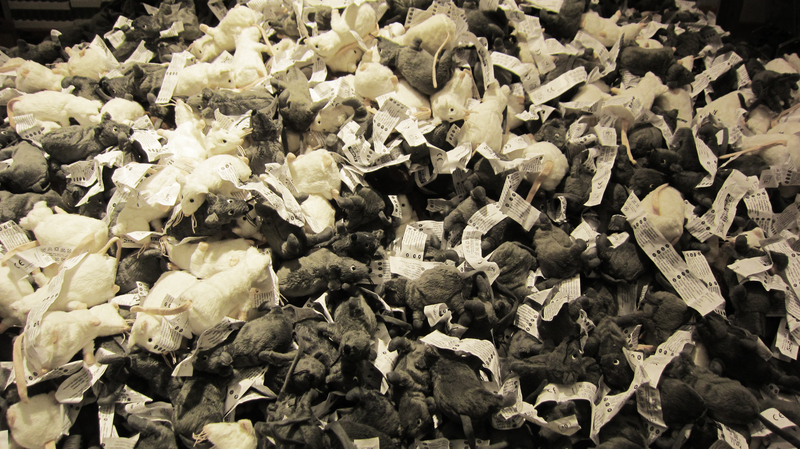 Is IKEA having trouble moving the mice? Or is there simply a surplus of mice? Maybe someone made a manufacturing mistake, like instead of making 100,000 mice they put an extra zero on the order by mistake and ended up with 1,000,000…just at this store! I mean come on, that is one ginormous pile of rodents. They are priced to move at about $1.40 a pop but with quantities like this, there is a need for action. So in my efforts to help out IKEA (despite the fact I can’t ever seem to get a job interview there), I have a suggestion. At least for the white mice. 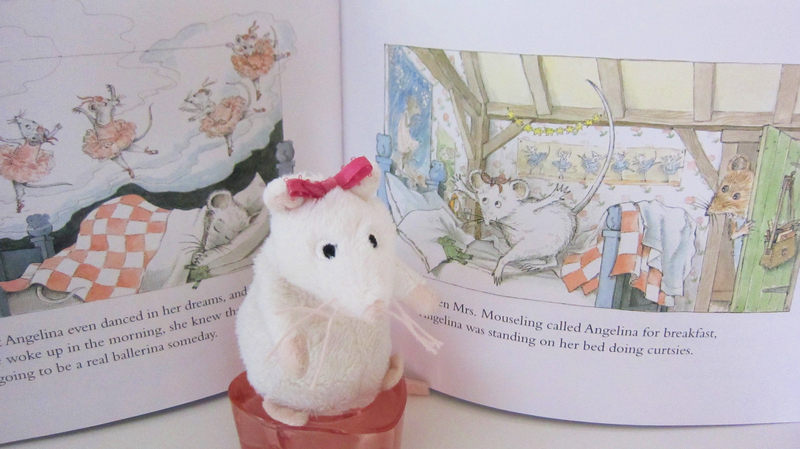 My 4-year-old is an Angelina Ballerina fan and has several books from the series. 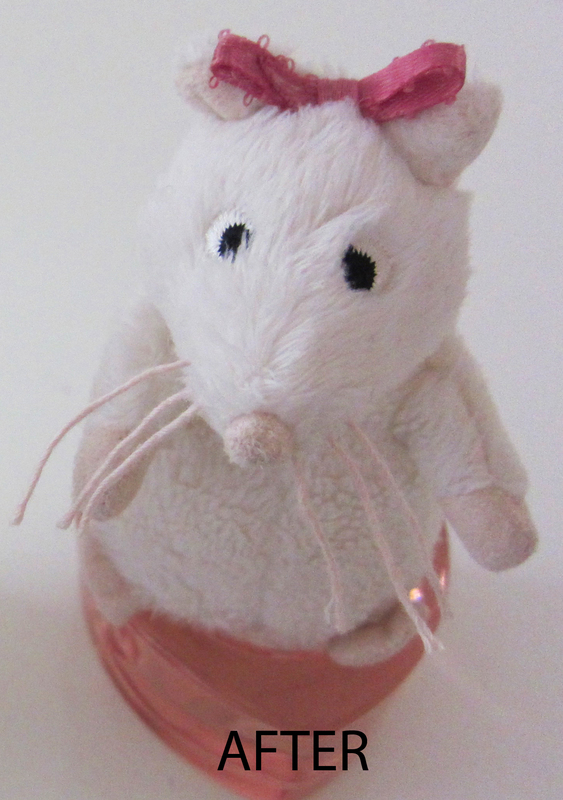 Angelina is a little white mouse with a pink bow on her head who loves to dance. 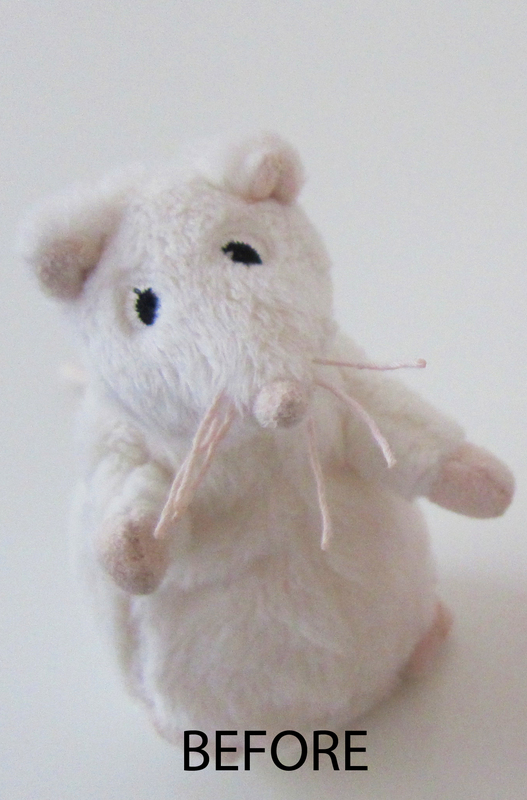 One day while reading Angelina Ballerina with my daughter it came to me that I could transform her generic, IKEA white mouse (which I’ve referred to as a rat for the longest time) into Angelina. A scrap of pink satin ribbon. My daughter was elated and that plain white mouse was an instant favorite. It started making trips to school, and being chosen to go in the bed at nighttime. Admittedly the BEFORE and AFTER aren’t exactly fair because I did fix the latter’s whiskers and give her a charming pink pedestal. But aside from all that ‘fancy stuff’ it’s the bow that does the magic. So if you have an Angelina Ballerina lover in your life and an IKEA in your area, you too can help to remedy this rodent problem. What to do with all the gray mice? Hmmmm. How about a little lesson about the plague for school kids and a bonfire to go with it? Ok, maybe not. But at least a dent can be made in the white mouse population while supporting a sweet children’s book series with beautiful illustrations. I love it! I was a little worried that you were going to write about a traditional Swedish Dish that had mice in it. Glad to be wrong. Angelina is perfect. Hahaha! I’m glad you were wrong too. What a snälla Mamma ! Thinking recently about a visit to IKEA, this blog is a sign that is is time. Mmmmm-meatballs ! ps jennaladue made me laugh. Talk about worried, look out for that can of surströmming . . . and stand WAAAY back ! I understand that you are in the U.S. Is it true that IKEA has stopped carrying some of the staples like Kalles kaviar and replaced it with their own brand? I have some UK friends who are really disappointed with the changes in the food section. I heard that too. I can’t imagine what might be in their brands or where they would come from. We rarely bought food at IKEA, outside of lunch in the cafeteria. We have a great store called The Auburn Gift Chalet about an hour north of us, just outside of Worcester MA. (the epicenter of Swedish culture in New England). They have the most extensive selection of Scandinavian foods and other items. It’s where we get salt herring to make inlagd sill, and the most wonderful Tallba soap – piney fresh! The best place to go when we long for Sweden, you can get everything without jet lag. Check their website, it is almost overwhelming. Also in Worcester is the Crown Bakery, a real konditori for homesick Skandis. But when we go to IKEA i’ll let you know if things have changed. Bad news. I found this story. http://www.thelocal.se/36748/20111014/ Thankfully you weren’t dependent on it anyway. We lived in Boston for almost 8 years and never heard of The Auburn Gift Chalet or the Crown Bakery. Too bad we didn’t realize Worcester was such a hub for Swedes in New England. It took my husband a long time to get over not being able to get ‘proper’ dark bread in the U.S. O.K., Seriously. This post is hilarious. I love the shot of the mice at lunch! Thanks for sharing. I have 8 Ikea rats and mice at home. They’re alllll mine.